Hailed as the 'Stradivari of the Hurdy-Gurdy', Pierre Louvain (d. 1784) was based in Paris, producing guitars and harps as well, and became the Dean of the Luthier's Guild in 1782. 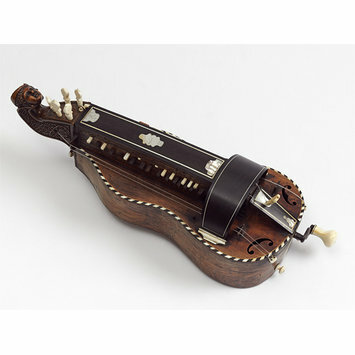 The hurdy-gurdy had long been regarded as a peasant's instrument and associated with pastoral music. However, a hankering after the simple life amongst certain French aristocrats in the years leading up to the French Revolution helped to make this instrument more fashionable. The sound of the hurdy-gurdy was made by playing the melody on keys and producing a background drone at the same time, by rotating a wheel, which rubbed the strings like the bow of a violin. 'A small sized instrument of the guitar shaped model. Belly and bakc of mahogany, the former with a barber's pole edging of ebony and ivory. Sides of rosewood, The keybod is stamped with the same bell-shaped motif as 6/1 [hurdy-gurdy, French, 17th century, stamed I.,/I. or P? Louvet and twice with the maker's name. The name is also stamped under the body, inside the lid (twice in each case), the keybox, is richly carved with interlacing stems and scallop-shells, and the finial has the form of a womnan's head waering a fancy Turkish head-dress. 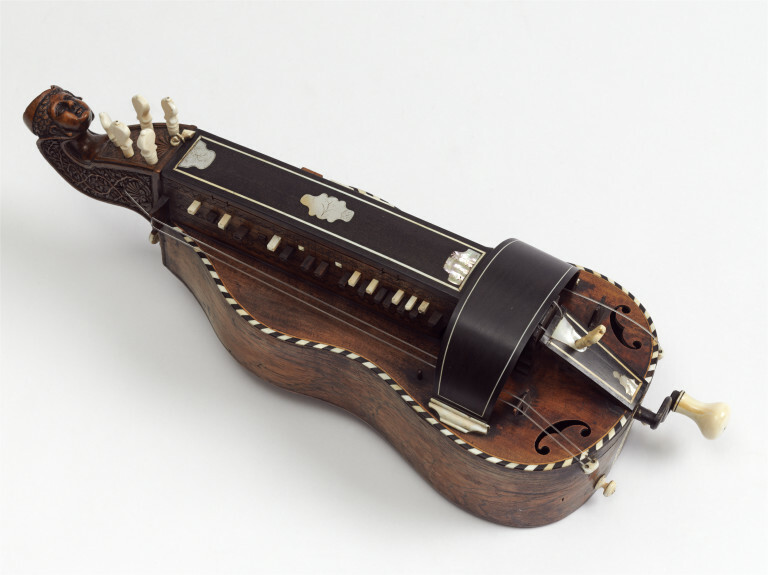 The tailpiece wheel-guard and keybox lid are of ebony with ivory stringing; the first and last of these also have small inlaid mother-of-pearl panels. Six pegs. Anthony Baines: Catalogue of Musical Instruments in the Victoria and Albert Museum: Part II: Non-keyboard instruments (London, 1998), p. 80. The name of the maker, P. Louvet, is stamped twice on the key box and once underneath the instrument. This object was bought from a dealer by the name of Evans, based in Paris, for £8 - 0 - 0 in February 1864. John Charles Robinson, Art Referee of the South Kensington Museum wrote, 'underneath the handle will be found an ivory plaque, on which is engraved P.Louvet who was probably the maker. French (Paris), Mahogany with ebony and ivory edging, Pierre Louvet, about 1750.